Tickets for the Sept. 23 showdown between the WBA, WBC Diamond and Ring Magazine champion Jorge “El Niño de Oro” Linares (42-3, 27 KOs) and the United Kingdom’s Olympic gold medalist and current No. 1 contender Luke Campbell (17-1, 14 KOs) will go on sale this Wednesday, August 2 at 10:00 a.m. PT/1:00 p.m. ET. The scheduled 12-round fight will take place at the “Fabulous” Forum in Los Angeles, California and will be televised on HBO Boxing After Dark® beginning at 10:00 p.m. ET/PT. Tickets are priced at $25, $50, $75 and $125, not including applicable service charges and taxes, with a total ticket limit of 12 per person. To charge by phone with a major credit card, call Ticketmaster at (800) 745-3000 or the Forum Box Office (Monday through Friday 11:00 a.m. PST to 7:00 p.m. PST) at (310) 330-7300. Tickets will also be available for purchase at www.fabulousforum.com or www.ticketmaster.com. 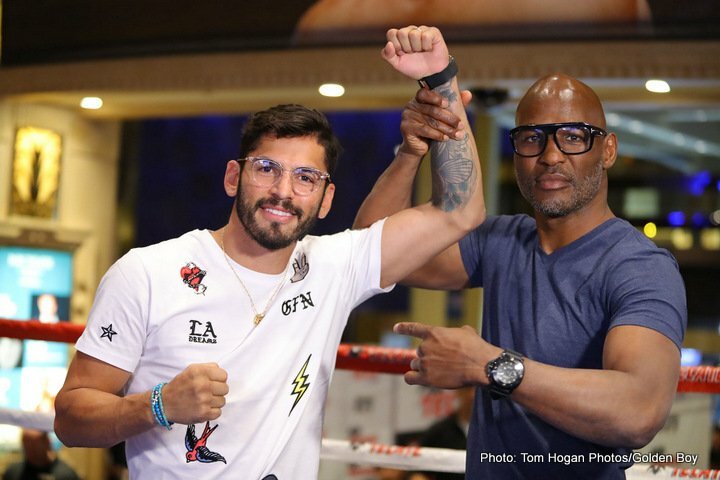 Originally from Barinas, Venezuela, Linares is a three-division world champion in the featherweight, super featherweight and lightweight classes. “El Niño de Oro” will look to solidify his status as the best lightweight in the world against former WBC Silver lightweight Champion and current No.1 ranked WBA and WBC contender Campbell. The Sept. 23 championship bout will be Linares’ debut as the headlining performance on HBO, and the third time in his extensive professional career to fight out of Los Angeles. WBA, WBC Diamond and Ring Magazine World Lightweight Champion Jorge “El Niño de Oro” Linares (42-3, 27 KOs) will put his titles and 11-fight win streak on the line Saturday, September 23 when he takes on Olympic Gold Medalist and No. 1 contender Luke Campbell (17-1, 14 KOs) in a 12-round main event from Los Angeles’ “Fabulous” Forum. The event will be televised live on HBO Boxing After Dark® beginning at 10:00 p.m. ET/PT. Linares, a three-division world champion of Barinas, Venezuela, who has captured titles in the featherweight, super featherweight and lightweight division, has spent much of his career in Japan. This time, however, Linares will fight in the U.S. for the first time in three years after first winning and then defending his titles against former WBA World Lightweight Champion Anthony “Million Dollar” Crolla in the latter’s hometown of Manchester, England. Campbell, a former WBC Silver Lightweight champion, who took home a gold medal in front of his English countrymen in the 2012 London Olympic Games, has defeated five solid contenders in a row including Darleys Perez, “Dirty” Derry Matthews, and Argenis Mendez since his only defeat nearly two years ago. Linares vs. Campbell is a 12-round fight for the WBA, WBC Diamond and Ring Magazine Lightweight World Championships, to be held Saturday, September 23 at the ‘Fabulous’ Forum in Inglewood, California. The championship event is presented by Golden Boy Promotions and Matchroom Boxing, in association with Teiken Promotions. The event is sponsored by Tecate, BORN BOLD and Casa Mexico Tequila and will be televised live on HBO Boxing After Dark beginning at 10:00 p.m. ET/PT. Next boxing news: Can the Can-Man Comeback?